" A Marianne's Creative Korner 2!" "A Marianne's Creative Korner 2!" 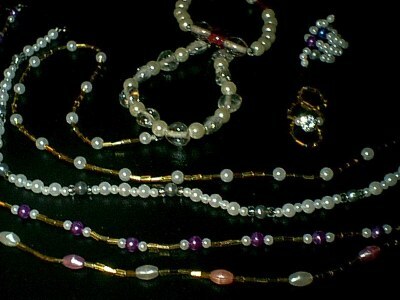 "My Original Jewelry Creations ..Plus." THANK YOU FOR THIS 'AWARD' BILL WILL! FROM...THE NET SET !! Love ya' Bill !!! Note : I have added more Creations...... Another 'Poncho/Cape'! ...........Also IMPORTANT TO YOU.....IF YOU CLICK THE 'RECOMEND IT ' (recomend MY site to a friend) YOU JUST MIGHT WIN 10,000 DOLLARS! Also take a look at ..My Brand New Crochet Jacket !! I have inserted 'Photo Instruction Ideas'. Please......Scroll all the way down to get to 'all' other pages. Vote for this site! "Marianne's Special Top 50 Sites" ADD YOURS ! Become 'MY SPECIAL FRIEND! Oh yes..............You can see me 'dance' to this FULL VERSION....on another site! 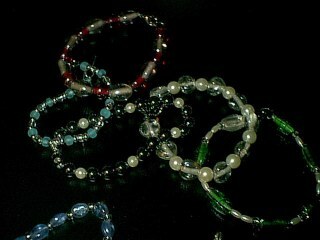 As I think you already know........ the 'latest' fad is 'beads' ! well, needless to say........ I just had to try this ! "Thank you...... for coming" ! I do 'wear' my own creations too. Why not? Right? By the way...I'VE JUST ADDED 'MY NEW (almost complete) CREATIVE HOME 20O1 ..SITE. AFTER YOU HAVE SEEN EVERYTHING HERE, PLEASE GO SEE 'ALL' THE NEW CREATIONS I HAVE NOW! Below and on following pages are 'some' of my Designs. 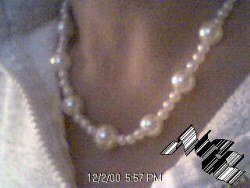 NECKLACES , BRACELETS AND RINGS...by M.E.C. "To a Glimpse..... of My Life" (Personal photos etc.) And I've just added a 'free submit site to 125,000 FREE LINK SITES YOU CAN ADVERTISE 'YOUR OWN' SITE ON !! here are a few more. They are soooooo easy to create. And FUN ! 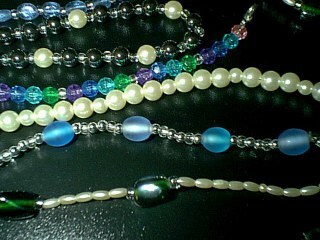 Some 'Mardigra Glass Beads....... and PEARLS for 'ME' ! 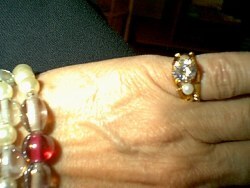 'clasps' (first at one end, where 'bead' will drop, then when finished at the other end. Very Simple) I felt like my kids and I used to spend many hours of fun at Christmas time...... stringing Pop Corn ! Look at the results, get some ideas!! 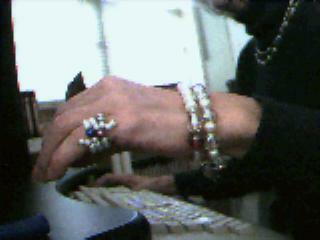 Below....... are some BRACELETS...... 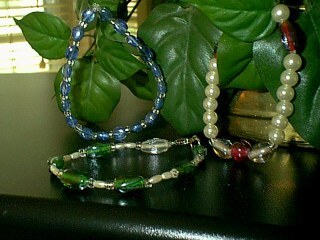 I enjoyed creating to go with some of the Necklaces. I do hope that you will go and 'visit' all the pages below ! in the pure hope ........... that YOU TOO will 'try' out your unknown talents!! now......click below!!!! See all my 'other' creations. I do enjoy sharing them. Click onto the rest of the pages on this site below.. I hope you visit them all! Newest Baby Afghan & Bonnet. "FREE ADVERTISE YOUR SITE HERE! PLUS FREE SUBMIT!". Now......How about some Cross Stitch?? "Welcome to Marianne's Creative Korner!" anyone.........came by for a visit. Why else would I share this? I'd love to hear from you !! Of course!! Hugs, Marianne. PS. You may wish to see 'all else' I do !! Please CLICK HERE FOR 'A Marianne's Creative Home 2001' ! My Main New Site! with lots of FREE STUFF, PLACE YOUR 'CRAFT' BANNER FREE, and sooo much more ! BEFORE You scroll back up ! OR, How about 'meeting' the Love of your life...if you don't have one for the moment. Or just for the 'fun' of meeting someone new! It's a great site. Like playing games?? Below you can get lots of 'free' ones!! Have fun! But, hope you don't desert me yet. REMEMBER, ABOVE..IS BANNER TO MY 'MAIN' NEW SITE !! ALL NEW AFGHAN Creations are shown there Plus...Soooo MUCH MORE !! 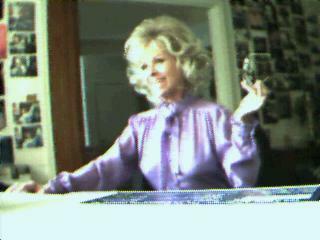 "A Mariannes Creative Home 2001!" my own 'free web site promotion page' try it. FREE site promotion ! !